As budget travelers, we fancy ourselves to be rugged adventurers. But even adventurers have to attend weddings and go on business trips. How can you uphold the carry-on-only ethos without ruining your expensive suit? The solution is two-fold: folding and packing. If you’re a regular reader of this blog, you’ve likely mastered the latter. Folding is the tricky part. If you’re like me, you roll your clothes when packing because rolling is easier than folding. I’m the guy that unfolds a shirt in a store but can’t figure out how to re-fold it. Apologies to the retail employees who have to follow in my wake folding clothes to make them presentable again. Despite my shortcomings, I have successfully packed a suit in a carry on. A carry on backpack to be more specific. The Outbreaker 45 is plenty big enough to pack a suit, along with enough other clothes for a month in cold, rainy London. Cramming all that into a backpack for a flight across a continent and an ocean probably wasn’t my finest packing moment, but my suit and I both survived. I’m not good enough at folding to have done this on my own. Instead, I turned to Jesse Thorn of menswear blog and video series Put This On. I followed Jesse’s advice from the video embedded below when folding my suit jacket and pants. His method is similar to bundle packing, an alternative to rolling your clothes. By following Jesse’s advice, your suit will be folded into a neat package with the lining facing outward so you don’t dirty your suit. 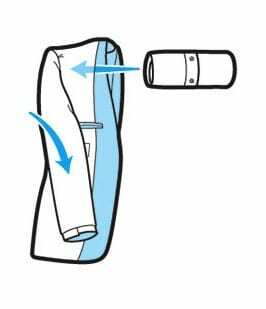 Your shirt can be folded into a similar shape and even bundled with the suit itself. The video below shows a tailor masterfully folding a dress shirt to minimize wrinkles. His technique for folding the sleeves really hooked me. Skip ahead to 1:45 in the video below to see how to fold a shirt so that it looks like you just took it out of the package. If you’re packing multiple shirts, use a packing folder to condense and organize them. Thanks to Jeff at Go Travelzing for recommending folders. My dress shoes. The lightest pair that I could find. Shoes are often the hardest thing to pack, especially on a trip where a specific wardrobe is required. When you’re backpacking Europe or adventuring in South America, you can get by wearing boots or sneakers and packing a light, alternate pair of sandals or boat shoes. Regardless of the purpose of your trip, always wear your heaviest pair of shoes and pack your other pair (if necessary). On business trips, a pair of thick-soled oxfords are likely your heaviest shoes. Wear them on the plane. Don’t worry about being overdressed. Oxfords look great with jeans. Plus, you can scoff at all the bums in sweatpants and flip flops. The rest of your wardrobe is easy. Drop your cufflinks in the pocket of your suit before packing it so that you can easily find them. Roll your ties and socks. Fold your pocket square. 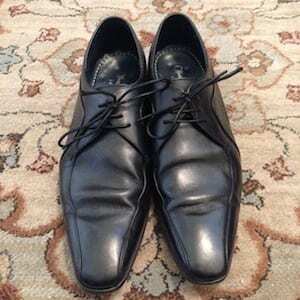 If you packed an extra pair of shoes, stuff your ties and socks in the shoes. Alternately, you can stuff them in the shoulders of your suit jacket to help maintain the jacket’s shape (see the diagram to the right). If you can’t put your accessories to use anywhere, just pack them in a packing cube with your underwear and other small items. Congratulations, your suit is packed and will survive your trip. 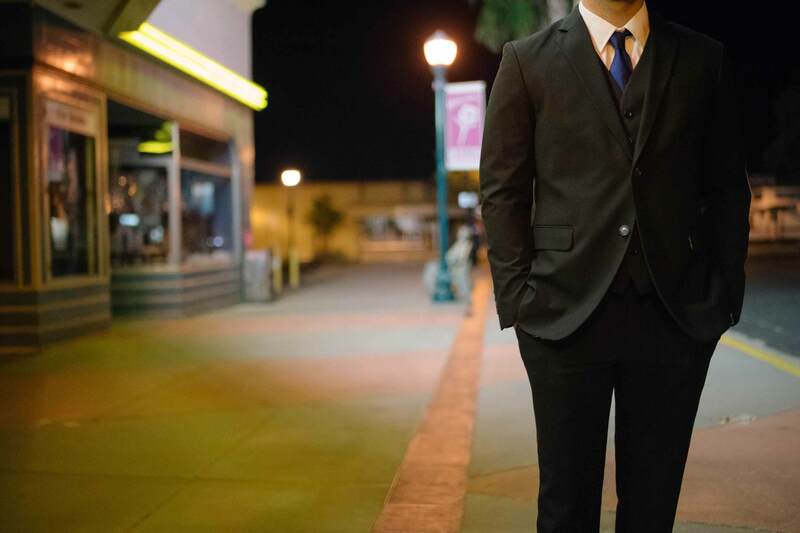 If you’re traveling for an extended period of time, don’t drag your suit around the world to wear it once. Just rent or buy one at your destination. If you’re traveling first class, a flight attendant can hang your suit up on a hook or in a closet. In that case, feel free to carry your suit separately in a simple garment bag.